@23J_Taylor joins ELITE company as he makes his mark in @BadgerFootball history. McCrary hit at line and picks up seven. He's always falling forward and moving pile. #Gophers get the ball right back. Croft finds Johnson for 19 yards! Kobe, not Koby, on McCrary. Sorry for the error. Emmit Carpenter kicks 20-yard field goal to give #Gophers a 10-7 lead on Illinois. Drive fizzled at the 1. Koby McCrary was a beast on the march, carrying eight times for 63 yards. Snap good. Hold good. Emmit Carpenter's 20-yard FG is up and GOOD! #Gophers up 10-7 with 8:33 left in the 3rd quarter. McCrary every play for rest of the game. McCrary with three tough runs in a row as the #Gophers enter Illini territory. He has seven carries for 68 yards today (9.7 yards per run). They can't stop what they can't catch. Jonathan Taylor makes his mark in @BadgerFootball history. The #Gophers D forces a three-and-out to start the second half! Minnesota takes back over at their own 33-yard line. #Illini about to receive the second half kick. Watch on @BigTenNetwork . 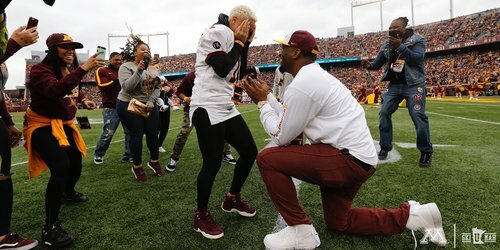 When #Gophers alum Ernie Wheelwright proposes, you say yes! Stat change: Carter Coughlin credited with forced fumble for #Gophers . Demry Croft is 3 of 9 passing for 25 yards in first half. Halfway through, still knotted at 7. The #Gophers remain tied with Illinois on #UMNHC . The second half is coming up! Emmit Carpenter misses 30-yard field goal off left upright with 6 seconds left in first half. Illinois coach Lovie Smith called two timeouts to ice #Gophers kicker. Carpenter hits upright on 30-yard FG after Lovie Smith called back-ti-back timeouts. This game is a mess. Carpenter hits the upright on a 30-yard FG attempt. Still tied 7-7 with six seconds left in the first half. 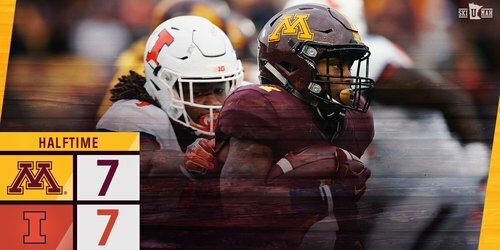 Merrick Jackson forces fumble and Steven Richardson recovers for #Gophers at Illinois 33. #Illini D forces another Gophers punt. Still tied. 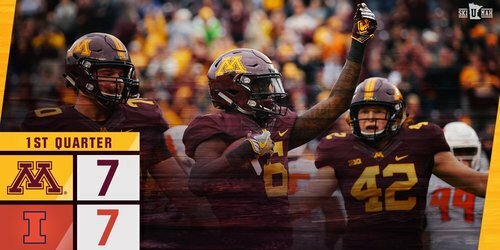 #Gophers take back over at their own 29-yard line after a 13-yard punt return from Hmielewski. Steve Richardson limped off after getting rolled up on back of his legs. 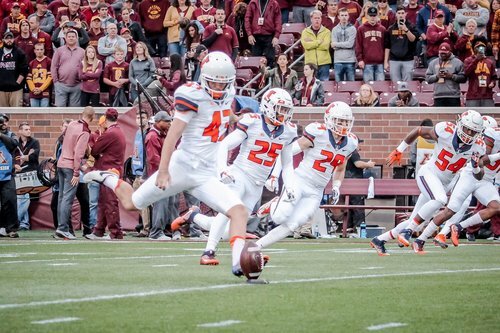 Santoso pins Illinois at their own 10-yard line with a 49-yard punt. Phillip Howard, who was injured on a big hit at Purdue, injured again on a big hit on an overthrow pass. #Gophers wide receiver Phillip Howard, who took hard hit to head vs. Purdue, shaken up on third-down pass after hard hit to chest. He walked off field with trainers. #Gophers defense forces 42-yard field goal attempt by Illinois, which Chase McLaughlin misses. Still 7-7. Illinois with a 42-yard FG attempt. NO GOOD! Ernie Wheelwright @Mr_MoneyErn2U just proposed to his girlfriend on field between quarters. And she said yes! We're all tied after one quarter. Illinois rotating true freshman QB Cam Thomas with Jeff George Jr. vs. #Gophers . Back-to-back incomplete passes by Demry Croft, one that slipped out of his hands, force #Gophers to punt. TOs to TDs. @jesusfreak21_ pounds it in after the fumble recovery. Tie Game.